From smart, energy-saving carbon monoxide detectors to ones that simply plug into an outlet, we found the best CO detectors available to keep your home and family safe. Carbon monoxide (CO) has been called the “silent and invisible killer” because it doesn’t have a smell, color, or taste. It’s one of the most prevalent causes of death due to poisoning in America. Any time you burn something—like gasoline, natural gas, wood, oil, propane, or charcoal—carbon monoxide is released into the air. In outdoor spaces, this usually isn’t a health hazard because there is enough area for the CO to dissipate, so particles never amount to a toxic level. The danger comes when carbon monoxide is released in a contained area like your home, RV, or garage. After much research, we’ve found the best carbon monoxide detectors available. From basic battery operated to smart devices, you can find the top options here. Before you buy, it’s good to break down exactly what to look for in a carbon monoxide detector. We’ll highlight several key factors that were part of our decision-making process to help you become a more informed consumer, but if you’d like to skip to the details on our recommended models, you can do that here. Carbon Monoxide doesn’t have a smell or taste, so you might not know right away that you’re being poisoned, but your body will. If you have carbon monoxide poisoning, you may feel dizzy, become nauseous, throw up, develop a headache, get confused, or pass out. It’s often been said that the signs of CO poisoning might resemble the flu. Every year, 400 Americans die from accidental carbon monoxide poisoning (from fuel burning, not fires), and 20,000 are admitted to the emergency room.1 If you become unconscious while carbon monoxide is filling your home, it can be life threatening. That’s where carbon monoxide detectors come into play. Once installed, they can alert you about high levels of carbon monoxide in your home, which will give you more time to get to safety. Who Is Most Susceptible to CO Poisoning? Everyone is susceptible to carbon monoxide poisoning. 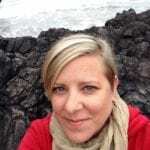 But, according to the Centers for Disease Control and Prevention (CDC), children, older adults, people who are physically ill, and pets are more likely to be affected by CO.2 The Mayo Clinic adds that unborn babies’ blood cells take in more CO than adult blood cells, which makes them more susceptible to poisoning.3 Older adults who experience high levels of CO could be more likely to incur brain damage. When it comes down to it, a CO detector can help save your life and the lives of the people you love. If you want to find out more information about CO detectors, check out our frequently asked questions page. If you or your family members experience carbon monoxide poisoning symptoms, quickly walk outside for fresh air and call 911. Even if you start to feel better, you can still have toxic levels of CO in your system and might require medical help. In this situation, it’s a good idea to have your whole family checked for poisoning, including your pets. Signs of carbon monoxide poisoning don’t always happen right away—it can happen over the period of days and possibly even weeks, depending on the levels of CO in your home. Carbon monoxide detectors are a lot like smoke detectors, but instead of looking for signs of fire, they detect levels of carbon monoxide. Depending on the brand, detectors operate in one of three ways: with a biomimetic sensor, metal oxide semiconductor, or electrochemical sensor. Biomimetic detectors use gels that change color after absorbing a certain amount of carbon monoxide—and then a sensor sounds an alarm. Metal oxide semiconductors have silica chips that detect CO and send electrical signals to trigger an alarm. Electrochemical sensors are considered to be the best in the industry. They use electrodes in chemical solutions that sense changes in electrical currents when carbon monoxide is present, and they sound an alarm. If you have a professionally monitored security system installed, it should come with a CO detector. Check out the top five security providers, all of which provide CO detectors with their monitoring plans. The Consumer Product Safety Commission recommends putting a carbon monoxide detector outside every separate sleeping area in your home.4 You might also want to add a carbon monoxide detector in your kitchen and basement for added safety. Also, make sure you install detectors close to bedrooms so alarms will wake you up if you’re sleeping. If you have an attached garage, you’ll want to place a CO detector by the entranceway. A vehicle that’s been left running in a closed space is a common cause for CO poisoning. In the grand scheme of things, it’s better to be overly cautious by placing CO detectors in every room, floor, and hallway than suffering CO poisoning. Most carbon monoxide detectors last an average of five years. Although the product’s lifetime will vary depending on your make and model, you can still get the most out of your detector by wiping it down weekly to keep it clean from dust and debris. It’s also a good idea to test your CO detector monthly. Start by pressing the “test” button to ensure the siren works. If your detector is older, you can purchase a carbon monoxide test kit to ensure that it’s fully functional. If the detector doesn’t go off when you test it, it’s probably time to buy a new one. These devices have a digital screen to show you levels of carbon monoxide in your home. Smart carbon monoxide alarms are the most advanced option available. They do their own diagnostics to make sure they’re working properly and sync with home automation apps so you can monitor your home from afar. Instead of using batteries, these carbon monoxide detectors are wired into your home’s electrical grid. Unless the power goes out, you won’t have to worry about devices losing battery and failing to work. This type is as basic as they come. Battery-operated carbon monoxide detectors may or may not have a digital screen. You’ll need to check your batteries once every three months to ensure your detectors are working properly. Nest Protect is leading the way with home automation and safety products. 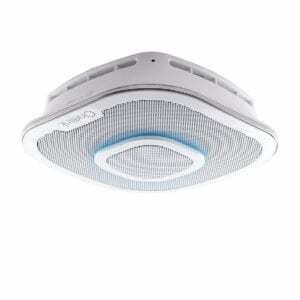 This particular model combines smoke and carbon monoxide detection and works with an app. When you download it, you can get alerts to your phone and even silence alarms if necessary. With state-of-the-art sensors for both fire and carbon monoxide, this alarm is one of the best for homeowners or renters. Nest protect works with an app and all other devices in your house, so if there’s a leak, you’ll know about it immediately—wherever you are. Then, you’ll be able to quiet the alarm from your phone. 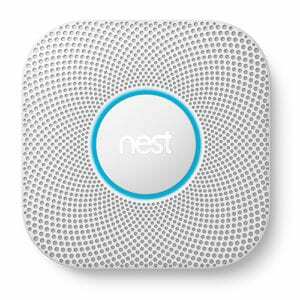 Your device will also alert you if it detects smoke in your home, so you get two-in-one. Plus, it’ll be able to tell where the fire is coming from. You can choose whether you’d like traditional battery operated devices or Nest Protect’s with wires you can connect to your electrical system. When Nest protect detects smoke or carbon monoxide, a human voice will notify you of the danger. You can order Nest’s camera to keep an eye on your home and see what’s going on during an emergency. Since you can’t change the batteries yourself or hardwire this unit, you’ll need to replace the whole thing once it expires. Its life expectancy of 10 years is still a good value. This company has been making fire safety products for over 90 years. As the world’s largest fire safety product manufacturer, it also produces high quality carbon monoxide detectors. 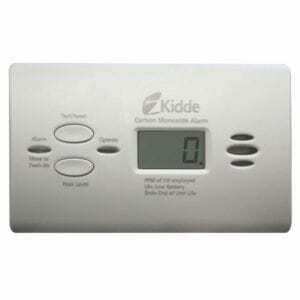 With a digital display, you can read your home’s carbon monoxide levels easily. Plus, the device refreshes its data every 15 second so you’ll know if something isn’t right. If your device sounds, you’ll definitely hear it. This carbon monoxide alarm lets out an 85 db beep that’s as loud as a blender. You can bring one of these devices home for about $30. Some alarms only tell you if your carbon monoxide levels have reached critical mass. This one will tell you if any particles are in your home, so you’ll know if there’s a leak that’s getting worse and get to safety faster. #1 Best Seller on Amazon. 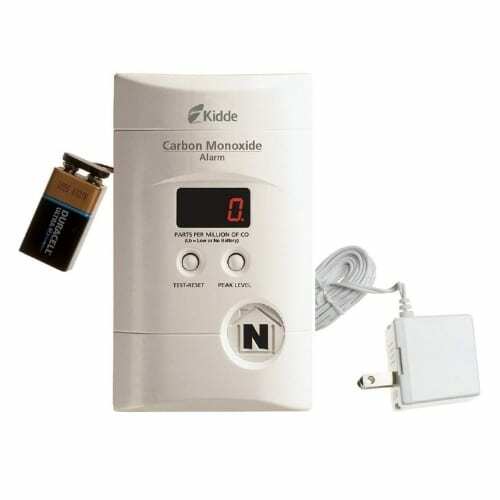 Customers love this device and it’s the most popular carbon monoxide detector on Amazon.Backup Battery. This is a hardwired carbon monoxide detector, but it has a backup battery in case you lose power. This is a hardwired carbon monoxide detector, but it has a backup battery in case you lose power. This isn’t as advanced as Nest Protect. You won’t get phone alerts or the ability to see where in your home the carbon monoxide is being detected. You have to wire this device into your electrical system for it to work—even though it has a backup battery. This is only a carbon monoxide alarm. You’ll have to buy smoke alarms separately. 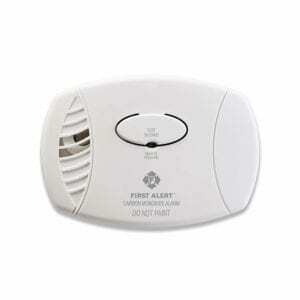 This smart smoke and carbon monoxide detector can do a lot. Using your home’s wifi, the alarms can talk to one another and synchronize to alert you if there is a gas leak or fire. They’re also controllable from your Apple device through an app, so you can silence them or get notifications on your phone. You won’t have to change batteries or hardwire this alarm. It comes with a 10-year battery that won’t annoy you with chirps. This is the first smart alarm to work with Apple’s HomeKit technology. If you have an apple device, you can get notifications from your First Alert alarms and control them from wherever you are. Expect to hear a human voice when this alarm goes off. If one alarm goes off, all alarms in your home will sound. You’ll have double the life-saving power in one alarm. When the battery dies, you’ll need a new alarm. This sweet little unit ensures that money stays in your pocket and your family stays safe—all while keeping safety on the down-low with its slim design. The First Alert CO400 Carbon Monoxide Detector can easily be placed in any room with an outlet, which gives you a lot of flexible placement options. The First Alert CO400 rings in just shy of $20, which makes it an affordable choice for renters, homeowners, and landlords who are looking for an effective CO detector that won’t break the bank. Thanks to the device’s electrochemical sensors, the readings are accurate and timely. The CO400 has a no-frills, simple silhouette that blends in effortlessly with your home. Users said they had a tough time opening and closing the battery compartment when the device needed more juice. Kidde’s battery-operated CO detector is equipped with the best sensor in the industry, an electrochemical sensor, to detect carbon monoxide in your home. And the digital display makes it easy to monitor your home’s levels of carbon monoxide. Plus, an 85 dB alarm will sound if dangerous levels accumulate without your knowledge. You’ll know exactly how much carbon monoxide is in the air with this digital display. The device will recalculate levels of carbon monoxide every 15 seconds and post them on the digital display for you to read. No wires come with this alarm, so you’ll only need to put batteries in and mount it on the wall. This alarm only costs around $20 on Amazon. These alarms don’t have smart capabilities, so you can’t control them from your phone. This stripped-down carbon monoxide detector doesn’t come with any extras, but it gets the job done. A number of user reviews praise this simple device for saving their lives. If you’re looking for a straightforward CO detector that has a good track record for detecting dangerous gas levels and sounding the alarm, the First Alert CO605 is a solid choice. All you have to do to set up this CO detector is plug it into a wall outlet. Once it’s plugged in, give the test button a try to make sure everything is in working order. You’ll like that the First Alert CO605 won’t hog all the space on the outlet you use. It’s small enough to leave the second plug free for a lamp, nightlight, or anything else you want to plug in. You don’t have to worry about losing protection if there’s a power outage. Even though this CO detector plugs into the wall, it has built-in battery backup to make sure you’re never left without continuous monitoring of carbon monoxide levels. There really are no extras on the First Alert CO605. There’s no digital display, voice alert, or smart home capability. 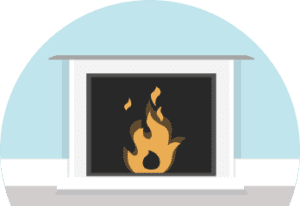 Lighting a fire in your fireplace is okay because it’s properly ventilated. However, if you do the following, you could cause dangerous levels of carbon monoxide to build in your home. What do you think of our picks for best carbon monoxide detectors and alarms? Is there something we missed, or what else would you like to know? also First Alert is compatible with both iOS and Android as well. Nice catch! We try to keep things updated, but sometimes tech moves faster than we do. We’ll update it!